Welcome to Travel Behavior & Urban Systems, Nebiyou Tilahun’s research group, based in the Department of Urban Planning and Policy at the University of Illinois at Chicago. We are interested in travel behavior, accessibility, and the social and economic dimensions of urban transportation. 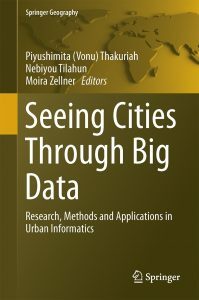 Our edited volume, Seeing Cities through Big Data, consisting of selected peer-reviewed papers from the Big Data and Urban Informatics workshop, co-edited with Vonu Thakuriah and Moira Zellner, is now available from Springer. We released the Metropolitan Chicago Accessibility Explorer, an interactive web based platform to visualize transit, walking, bicycle, and automobile accessibility in the Greater Chicago Metropolitan Area. Along with colleagues, we organized the 2014 NSF sponsored Big Data and Urban Informatics Workshop. The proceedings from this workshop can be accessed here (opens in new window). We are currently working on issues at the intersection of social exclusion and transport in collaboration with colleagues at UIC and other institutions. Please browse the site to see what we are working on.